An“A” paper was never created on the first draft. Here are some editing tips for kicking your next paper up a notch. Let’s face it. After spending a ton of time researching and writing a paper, no one wants to take another look at it. You’ve had it up to here with those tiny black streaks on a bright white screen and the continuously blinking cursor that mocks your lack of literary elegance. But here’s the truth. As much as it hurts to do it, you have to give your paper another look through. 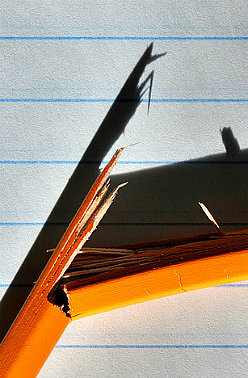 In college and graduate school, first drafts do not make the cut. Whether you pursuing your education through an online degree program, or a traditional on-campus program, all students have to write – and rewrite – papers. Here are some tips to help you push through the editing process. 1. Put your paper aside and outline. Once you are finished with your paper (or even just a paragraph), set your writing aside and draft a quick outline of what you want that piece of writing to accomplish. This not only helps you solidify that you are, in fact, keeping on topic, but it also helps the flow of your writing. For example, you might find that you set out to write about how the Saint Leo core values apply to your coursework, and after looking back on your paper, you are talking about how the core values affect students at Saint Leo. Don’t be fooled by the term “outline.” This doesn’t have to be formal at all. You can write anything from single words to sentences or use graphic organizers— the form doesn’t matter as long as you know what you set out to do and can compare it to your work. Does your thesis answer the question on the assignment? Sometimes you may need to revise your thesis after you’ve written the meat of the assignment because it may have slightly changed. This is nothing to worry about. Your thesis – unless your professor says it needs to stay the same as what you proposed – can change with your research and writing. You may even find that when you are finished writing, the path you originally chose does not quite fit what you originally started. Just read through your paper and think about the point you are now making and fit it in with your original thesis or write a new one altogether. 3. Review your topic sentences and body material. Do your topic sentences for each paragraph and body material relate back to your thesis? Think about your body material as mini-essays with your topic sentences being the thesis. You don’t want anything to go off topic. The same thing goes for your body information. For example, follow the topic sentence above, with an explanation of how you would apply Personal Development in each assignment. 4. Look at your conclusion. New information does not belong in your conclusion. Rather, briefly summarize what you covered in your paper. Don’t include a blatant restatement like, “This is what I talked about.” Instead, sum it up in fresh words. 5. Give credit to all sources. Properly cite all direct quotations and paraphrases. If you aren’t sure about whether or not you need to cite something, cite it just in case. It’s always better to over-cite than under-cite. Also, include a works cited or reference list at the end of your paper. If you have questions about works cited or references pages, refer to your respective style’s (MLA or APA) section. Here are a few of the most common grammar errors to look for when revising. Contractions: Avoid contractions in your academic writing. Write out the words. Does it match the style your professor wants? MLA, APA, or something else? If you’re not sure, check out Purdue’s Online Writing Lab: http://owl.english.purdue.edu/. 8. Read your paper out loud. This trick will help you catch things you might have skipped when you read silently. It works because it incorporates another one of your senses into the mix. If you to stumble over a section there is, most likely, something you need to address. Correct as you go or mark it and come back to it later. 9. Take advantage of writing support services. If you are an on campus student, stop in or visit tutoring.saintleo.edu to schedule an appointment with an English tutor. If you are an online student, you can schedule an appointment on SmartThinking. Don’t have an account yet? Email joanne.maceachran@saintleo.edu to setup an account. 10. Don’t be satisfied with a first draft. Writing is a process that doesn’t end with the first draft – even though we all wish it would! Unless you are backed into a corner by time, don’t be satisfied with a first draft. You can improve your words by running them through the writing ringer. Don’t feel discouraged by the process because it is a tough one – especially when you are just getting into the habit of writing at the college and graduate level. You usually won’t catch everything during editing – after all, you’re human – but you’ll most likely save yourself the heartache of silly errors that can be the difference between a hard-earned A and one of those lousy B+s. What other tips do you have for creating an awesome essay or research paper? Colleen Sexton, SLU Class of 2010, is a professional English tutor in Saint Leo’s Learning Resource Center. She is married to her high school sweetheart and is an avid reader and writer of young adult fiction. She loves working with students who are looking to improve their writing because she believes everyone can be effective writers if they are pointed in the "write" direction. You can reach Colleen in the LRC at 352-588-8307 or colleen.sexton@saintleo.edu.